So you know what to expect if attending the Malofiej infographic conference this is a homage to a lovely piece of work that I first saw at the conference, Fortune’s ribbon chart. Malofiej is three days of intensive infographic mutual support, encouragement, debate, drinking and discussion. And if your stamina is good, there’s a three day workshop you can attend before the conference begins, “Show, Don’t Tell”. The whole thing climaxes in a grand dinner on the Friday night to announce the winners of the international infographic competition. And the previous year’s winners are pulled together in the annual Malofiej book. 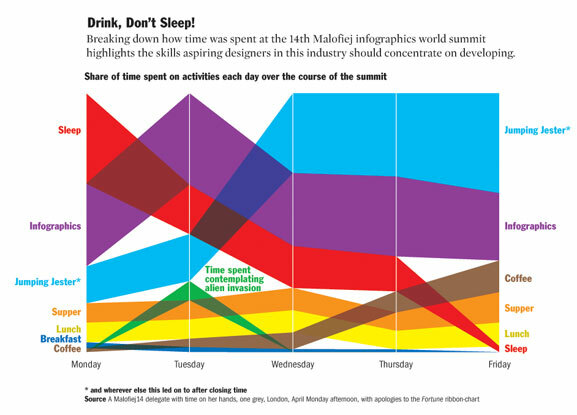 Agreeing with me that working in a department of one person – me – there might benefits to be had by meeting other infografistas, my employers were kind enough to agree to let me go to Malofiej. This is the biggest, best, annual infographic conference to attend if you live in Europe.